Top row from left: Pat Capozzi, Jack Ozark, A (Unknown), Sue Shigida, B, Mitch Rochon, C, John Sparey, Steve Gordon, Bruce Woodside, James Gurney, D, Tom Tataranowicz, Jan Cummings, Thomas Kinkade. 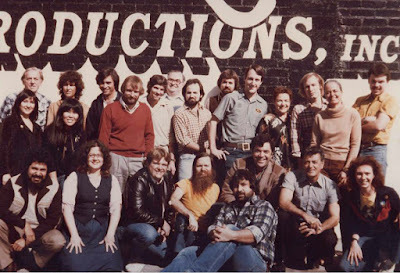 Bottom Row: Bill Recinos, Debbie Hayes, Mike Svayko, Tim Callahan, Mauro Maressa, Ralph Bakshi, Frank Frazetta, E.
Ralph Bakshi Productions crew photo in 1981, during the production of the animated film "Fire and Ice." Here's the trailer (Link to YouTube). Wikipedia on the original Fire and Ice. Was Fire and Ice produced in California? I knew Bakshi wanted to open a New York studio for years and I believe that his earliest films were produced in NYC using many of the staff he had worked with at Terrytoons in New Rochelle. Another question but was Johnny Vita involved in Fire and Ice at all? He had worked on many of Bakshi's earlier films as a layout artist and background painter. I remember seeing an exhibition of his artwork at Westchester Community College about 20 years ago that included some of his Bakshi work as well as his own paintings. You didn't happen to work on Wizards too did you James? Loved that movie - had a real impact on me and the kinds of art classes I took in high school (I recreated the movie poster several times in different mediums). Pierre, the studio was in Sunland, California, near Burbank. Tom and I met Johnny Vita, but he was leaving when we were coming in. Seadit, No, I loved Wizards, but that movie and Lord of the Rings and American Pop were before my time. simply a great picture. James, you look flash with hair and your cool posture. Too early for a Department of Art patch on your shirt...it still looks like some type of uniform shirt with embroidered patch, yes? Steve, yes, I had a bunch of uniform shirts that just said "Jim."